More often than not, I rely on black to get me through the coldest months of the year. There’s something so easy and effortless about it, but it also just makes sense to wear something dark on the darker days of the year. Every once in a while though, I crave a little color and light. 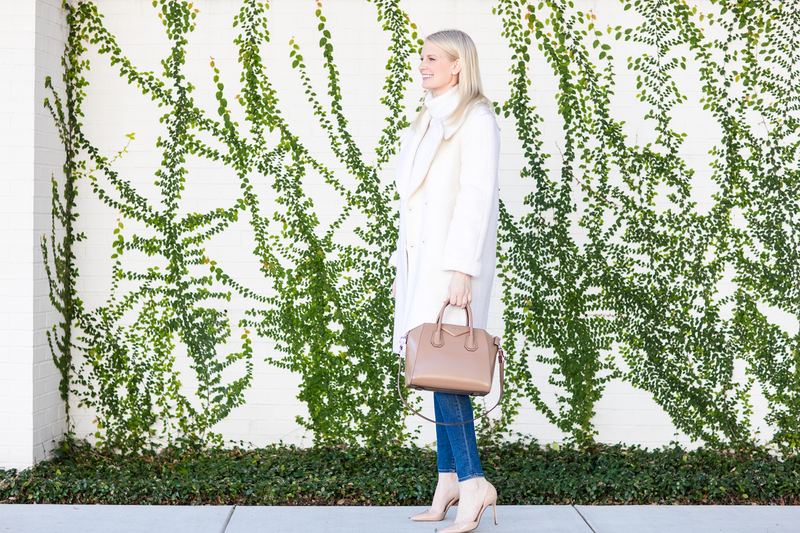 I’ve never really spent a whole lot of money on winter white (even though I have a lot of it in my closet! ), simply because of how delicate it is. I’m generally a very neat person, but I tend to have ridiculously bad luck with spills and things. While I’d LOVE to splurge on a cushy cashmere coat, I just don’t want to risk it! That’s why when I found this ASOS coat for only $152, I had to get it. 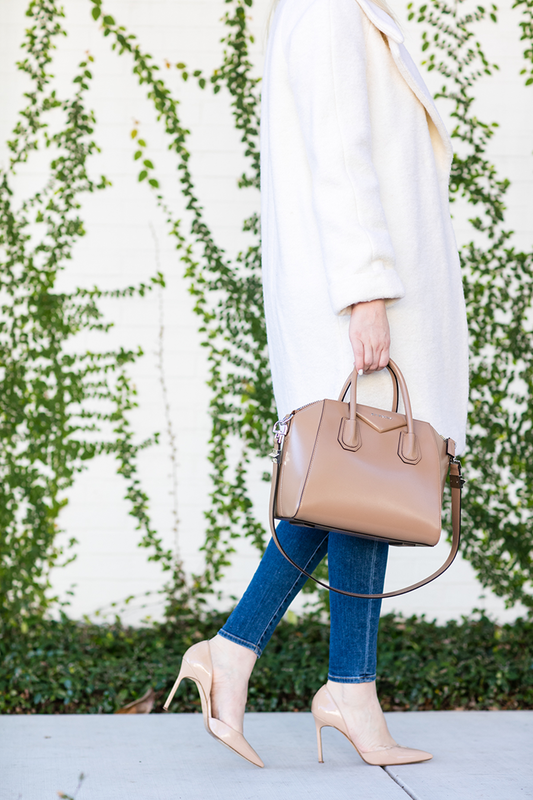 It’s not every day that a chic winter white coat pops up on the scene. It’s just the piece that’s been missing from my winter wardrobe. 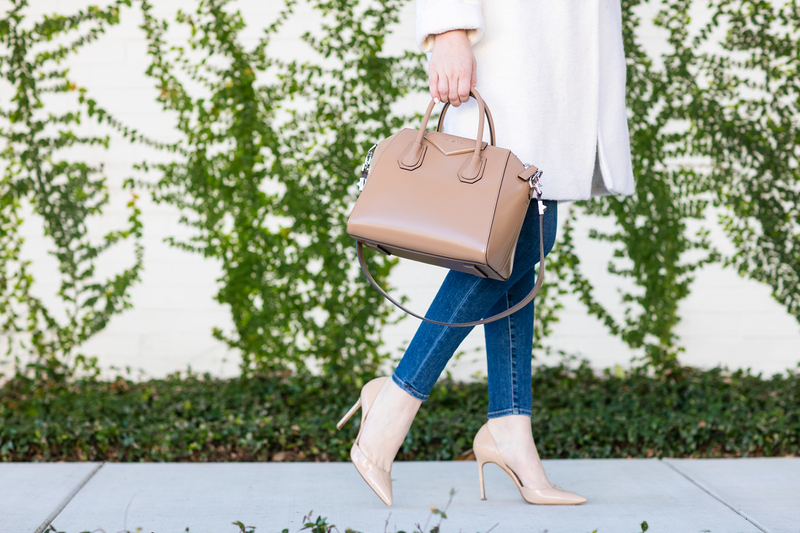 It’s ideal for the days we’ve been having lately here in Dallas – it’s been so sunny and gorgeous outside, but still super chilly. Is it just me, or do your outfits totally reflect the weather? You look so chic and this is a perfect winter look! I bought that white coat last night! I’ve been trying to find one for months. I love how you styled it! So chic. Beautiful coat- it looks so cozy! Such a beautiful and chic look! I love wearing white in winter! Love this look! Your blog is seriously my favorite. And, your cauliflower & spaghetti squash recipes are now weekly staples in my kitchen. If you’re ever in Nashville, let your readers know! Love this look! In love with your coat! I am going to be that person, but do you have a favorite heel that is comfy but lower price point? Started a new job and even my vinces are killing me! That is the chicest coat! And what a great price. Total score. Love it with your neutral accessories. Classic and clean, just gorgeous as always!